Japan has invested hundreds of billions of dollars between 1960’s and 2011 in pursuing the dream of nuclear energy. Money is still being poured into the industry, but these days it is mostly just for maintenance of idle reactors. In 2011, there were 54 nuclear reactors operating in Japan and were generating about one-third of Japan’s power. However, following the Fukushima accident, in 2011 the government required to greatly reduce the role of nuclear power and ordered an immediate review of the safety aspects of the remaining reactors. Today, there are just four nuclear reactors are in operation across Japan and other eleven are in the process of being decommissioned and decisions are yet to be made about 42 other reactors. The market for reactor coolant pumps largely relies on the decommissioning of nuclear reactors in Japan and the future prospects for the market are sluggish as the process of restarting the nuclear reactors is very slow. Goldstein Research analyst forecast the Japan nuclear reactor coolant pumps market to decline at a significant pace during the forecast period 2016-2024. Moreover, coolant reactors market during the forecast is likely to be driven by the export of coolant pumps by major manufacturers in developing countries and aftersales in Japan owing to an expected restart of closed nuclear reactors. The report covers the present ground scenario and the future growth prospects of the nuclear reactor coolant pump market for 2016-2024 along with the total revenue of nuclear reactor coolant pumps industry in Japan. We calculated the market size and revenue share on the basis of revenue generated per segment at regional level. The revenue forecast is given on the basis of the number of nuclear reactor coolant pumps manufacturers and current growth rate of the market. Based on reactors, pressurized water reactors accounted for the highest market share in Japan nuclear reactor coolant pumps market in 2016. Moreover, electricity production is likely to dominate the market over the forecast period owing to major demand for replacement and maintenance in existing nuclear reactors. Japan Nuclear Reactor Coolant Pumps Market Outlook 2016-2024, has been prepared based on an in-depth market analysis from industry experts. 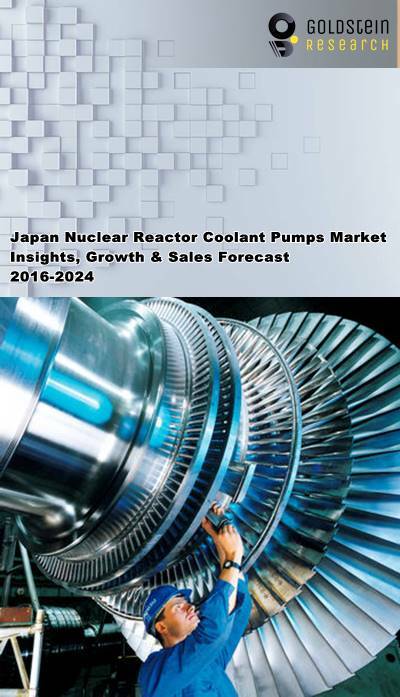 The report covers the competitive landscape and current position of major players in the Japan nuclear reactor coolant pumps market. The report also includes porter’s five force model, SWOT analysis, company profiling, business strategies of market players and their business models. Japan nuclear reactor coolant pumps market report also recognizes value chain analysis to understand the cost differentiation to provide competitive advantage to the existing and new entry players. Our Japan nuclear reactor coolant pumps market report comprises of the following companies as the key players in the Japan nuclear reactor coolant pumps market: Areva, SPX Corporation, KSB Pumps, Weir Group PLC, CNNC (China National Nuclear Corporation), Rosatom, Westinghouse Electric Company, CGN, Hitachi GE Nuclear Energy, Mitsubishi Heavy Industries, Andritz AG, Dongfang Electric Corporation, Ebara Corporation, Flowserve Corporation, Curtiss-Wright Corporation, Shanghai Electric Group Company Limited and Sulzer AG. According to our Japan nuclear reactor coolant pumps market study on the basis of extensive primary and secondary research, major demand for nuclear reactor coolant pumps market will be generated from the existing nuclear reactors and restart of closed nuclear reactors in coming years as the maintenance and replacement parts will be needed for faultless operations to generate electricity. Further, the report states that one challenge in Japan nuclear reactor coolant pumps market is concerns regarding nuclear safety and liability and public perception and acceptability of nuclear technologies are the major challenges for the growth of nuclear reactor coolant pumps market in Japan.